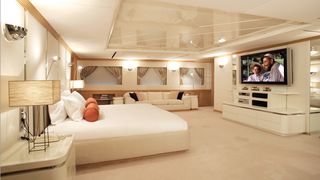 This sprawling cabin is the master suite of 58.67 metre Elsflether Werft Magna Grecia. Get a good night's sleep on the king size bed, flanked by magnolia and chrome furnishings – or simply lounge in the suite and put a movie on the big screen. This sprawling cabin is the master suite of 58.67 metre Elsflether WerftMagna Grecia. Get a good night's sleep on the king size bed, flanked by magnolia and chrome furnishings – or simply lounge in the suite and put a movie on the big screen. This spectacularly spacious owner's cabin is sadly no more. Previously the master suite on Turquoise 53.2 metre explorer yacht Vinydrea, she was refitted with a new interior and renamed Kinta. The opulent interior of luxury charter yacht Kinta was overhauled for the charter market in 2013, giving her a more classic look with dark wenge wood flooring, while coordinating satin, leather and cotton finishings are found throughout the yacht. This spectacularly spacious owner's cabin is sadly no more. Previously the master suite on Turquoise 53.2 metre explorer yacht Vinydrea, she was refitted with a new interior and renamed Kinta. 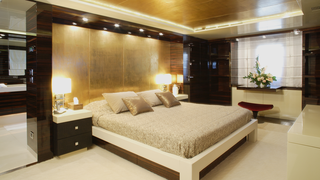 The opulent interior of luxury charter yacht Kinta was overhauled for the charter market in 2013, giving her a more classic look with dark wenge wood flooring, while coordinating satin, leather and cotton finishings are found throughout the yacht. Another example of an owner’s cabin that is no more, this used to be the suite on Mondo Marine's Panther II. Last year, she was renamed Barents Sea and refitted for the charter market with a beach house chic interior. The calming mix of beige, gold and dark wood is certainly striking, but it's been swapped out for a more modern and universally appealing, neutral decor with a white and grey palette. The new owners have, however, preserved the art-work resin walls (as shown above), which were created by the wife of her previous owner. Barents Sea is currently for sale. Another example of an owner’s cabin that is no more, this used to be the suite on Mondo Marine's Panther II. Last year, she was renamed Barents Sea and refitted for the charter market with a beach house chic interior. The calming mix of beige, gold and dark wood is certainly striking, but it's been swapped out for a more modern and universally appealing, neutral decor with a white and grey palette. The new owners have, however, preserved the art-work resin walls (as shown above), which were created by the wife of her previous owner. Barents Sea is currently for sale. Amber hued lighting, ornamental lamps and long-tufted pale carpet with gold filigree evoke an historic (yet stylish), Old World charm aboard 47.9 metre Trinity Yachts-built Janie. She's been refitted (and renamed – now Cocktails, also previously Chevy Toy), but the layout and concept of the master suite remains the same. An interior refresh has seen the bed and joinery darkened, the carpet updated and the headboard revived with a faux leather finish. 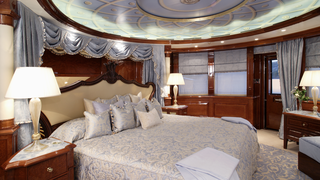 Amber hued lighting, ornamental lamps and long-tufted pale carpet with gold filigree evoke an historic (yet stylish), Old World charm aboard 47.9 metre Trinity Yachts-built Janie. 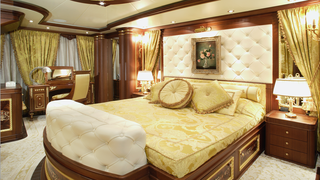 She's been refitted (and renamed – now Cocktails, also previously Chevy Toy), but the layout and concept of the master suite remains the same. An interior refresh has seen the bed and joinery darkened, the carpet updated and the headboard revived with a faux leather finish. Recline in style aboard the 62 metre Viareggio Superyachts-built RoMa. 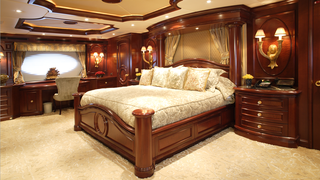 With a sprawling king size bed, offset by silk-lined walls and contrasting gold and mahogany plush cushions, this master suite oozes quiet opulence. This is what the owner's cabin of 60 metre BenettiSt David _looked like in a previous life, when she was called _Xanadu. A skylight above the bed pours light into the opulent master suite. The luxurious lilac Louis Moreau quilted silk bedcovers and window treatments have been given a gentle update but the room remains fairly similar. 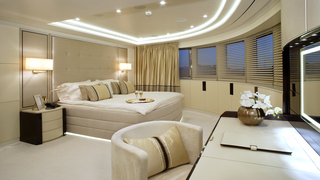 The Bannenberg & Rowell–designed owner's suite on 39 metre Feadship-built Kathleen Anne is a delight to the eye. Walnut woodwork is offset by contrasting pale oak, while the forward facing windows in the spacious master suite offer unrivalled panoramic ocean views. Soak in the unrestrained luxury aboard 47.5 metre ISA-built Aquamarina. With her rich mahogany panelling, flanked by gold furnishings and complemented with fine art decorating the walls, this Cristiano Gatto-designed interior echoes a 5 star hotel.